HALO Foliar Spray has been extensively tested throughout the world and will provide a range of benefits, including a higher growth rate when using lights due to an increase in photosynthesis by up to 25%. In addition, nutrient uptake in plants is also increased. Ultimately HALO provides value to growers by increasing yield and fruit quality. It activates growth mechanisms that result in improved plant vigour and increased plant stamina as well as an improved stress defence response. HALO also activates cell wall expansion and cell elongation along with protein and sugar transport as well as promoting flower initiation and fruit set and size. It stimulates defence mechanisms increasing the plant's ability to defend itself against certain viral and bacterial as well as fungal plant diseases. Pre-harvest applications reduce the incidence of Botrytis (bud rot) and extends crop shelf life. Since the plant needs to convert the eliciting effects from HALO into biochemical processes, the best effects are obtained when the product is applied to physiologically active plants. Treatments are recommended around critical crop physiological growth stages, such as flower induction, fruit set, fruit enlargement and pre-harvest. In some perennial crops, the treatment of HALO in the previous season can affect the plant in the following growth cycle or spring. This can also benefit cuttings/clones taken from the treated plant. This can result in earlier bud formation and hence greater flowering potential. Always apply foliar feeds when the sun is down or when the lights are off to avoid scorching your plant. Trials are also showing great benefits as a seed soak in some crops and this research is continuing. Top Tip: If you need to keep your plants small, do not apply in the vegetative stage of their development. Mix one sachet with 500ml of water and spray. Apply 2-4 times throughout the growth cycle. Spray directly onto leaves at low light levels or just before growlights are switched off. Treatments are recommended around critical crop physiological growth stages such as exponential vegetative growth, flower induction and 1 week before harvest. Mix HALO in water at a dilution rate of 10ml per litre of tap water and apply with a sprayer. 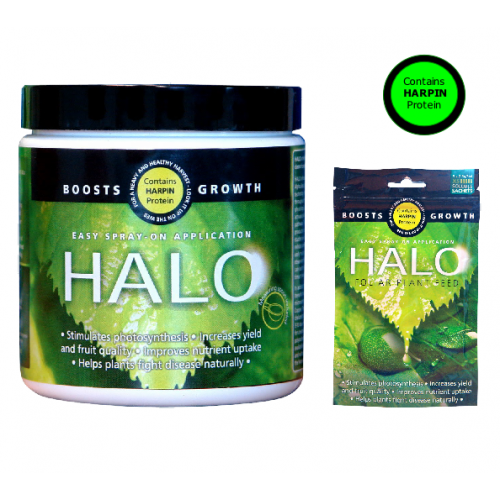 A HALO 2.5g soluble sachet will give maximum benefit when mixed with 500ml of water. Mixed in 1 litre of water it will be less concentrated but still offer great results. In general apply every 2 weeks in flowering and once during the last week.